WELD COUNTY — A Texas-based oil and gas company has acquired 17,000 acres of agricultural land in eastern Weld County. 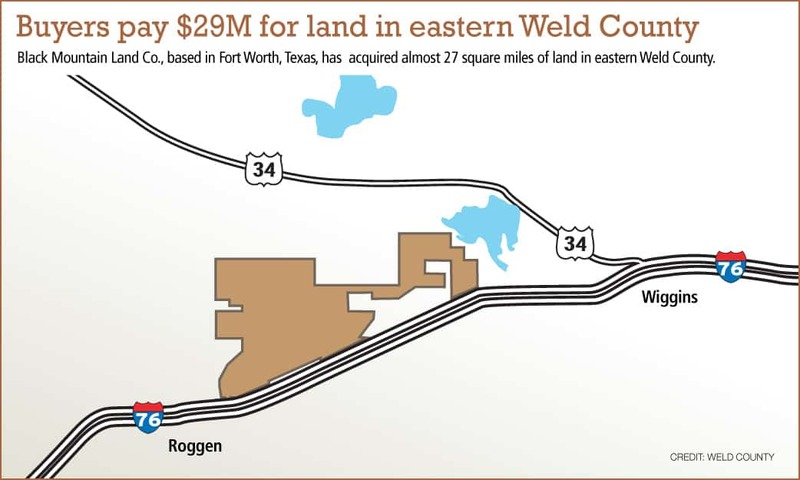 Black Mountain Land Co. LP, established in 2012 by Rhett Bennett, founder of Black Mountain Oil and Gas LLC based in Fort Worth, paid $29 million to Lost Creek Land and Cattle Co. LLC for the land, according to Weld County public documents. Public records show that Black Mountain Land Co. now owns 57 parcels totaling 17,000 acres, or almost 27 square miles of land, in Weld County. All the land is south of U.S. Highway 34, east of U.S. Highway 85 and north of Interstate 76 near the unincorporated town of Roggen. Black Mountain did not respond to a request for more information on what it plans to do with the land. Brad Peterson, former manager of Lost Creek Land and Cattle, confirmed the 17,000-acre Lost Creek ranch was sold, but an attorney for Lost Creek declined to provide additional information. The property had been marketed recently for $29.95 million and has operated as an income-producing farm and ranch. It includes 14,480 acres of grazing land and 2,620 pivot-irrigated acres, according to an online listing. Black Mountain, founded in 2007, has since created several companies, each one specializing in various aspects of the oil and gas industry. They are Black Mountain Sand, Fort Worth Mineral Co. and Black Mountain Metals, according to the company’s website. Black Mountain’s companies specialize in mining for frac sand, drilling wells, mediating contracts between oil companies and landowners, and leasing land it owns to other oil and gas companies. Black Mountain has leased more than 200,000 acres in various resource plays across six basins and five states, and acquired mineral and royalty interests in more than 10,000 oil and gas wells covering 800,000 gross acres in 11 states. In 2016, Natural Gas Partners Energy Capital based in Irving, Texas, took a $150 million equity stake in Black Mountain Oil and Gas. In 16 months, Black Mountain acquired 18,000 acres in the Northern Delaware Basin in West Texas through 40 separate transactions. In March 2017, Black Mountain Oil & Gas sold the portfolio to Marathon Oil for $700 million.